Testing sleeve shafts (e.g. for helicopter drives and aircraft industry) involves the use of rotation manipulators. 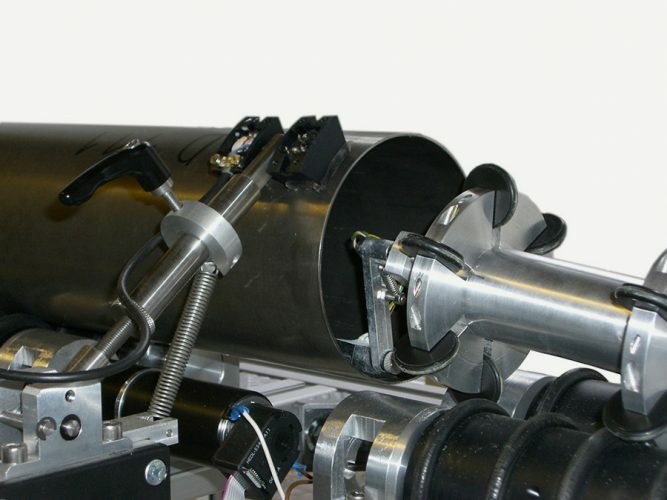 With this, straight semi-finished products – shafts and tubes – can be tested seamlessly and fully automatically for internal and external defects by two probe systems that can be navigated separately. Both systems allow the creation of C-scans of the entire tested surface. Test objects up to 3 m in length can be tested. The test device is designed universally, so that similar test objects can be tested with minor adaptation effort.